Published: Schoonover, Frank E. “The Fur Harvesters.” Harper’s Monthly Magazine, October 1912: 110. Seton, Ernest Thompson. “Is Our Fur Supply in Danger?” World’s Work, March 1924: 499.
caption: The return of the fur fleet is to the frontier post what a Caesarian Triumph was to Imperial Rome. Laden with the results of a winter’s trapping and shooting, it is greeted with a rejoicing pent-up for many moons. 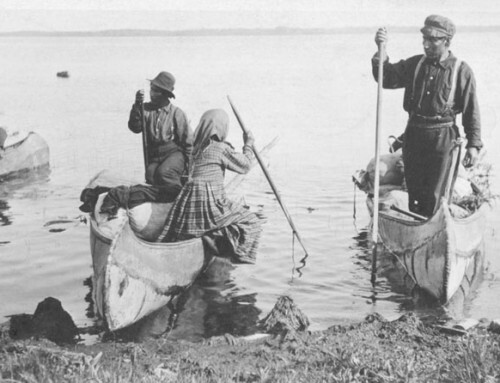 “Sketch Book…featuring the work of outstanding Delaware artists.” Dateline Delaware, September-October 1960: 27.
caption: “Coming of the Cree and Ojibwa Trappers to Hudson Bay Post, at Long Lake, Canada”. 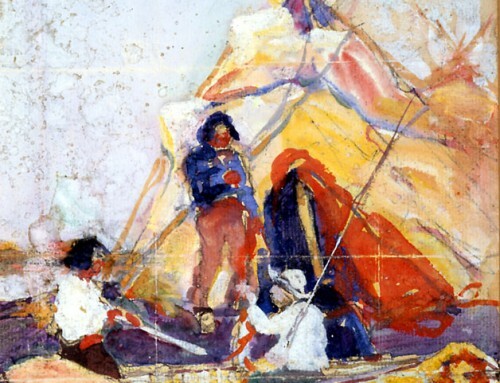 This painting was used as an illustration in Schoonover’s story, “The Edge of the Wilderness”, published in Harper’s Monthly. In the General Motors Building collection. 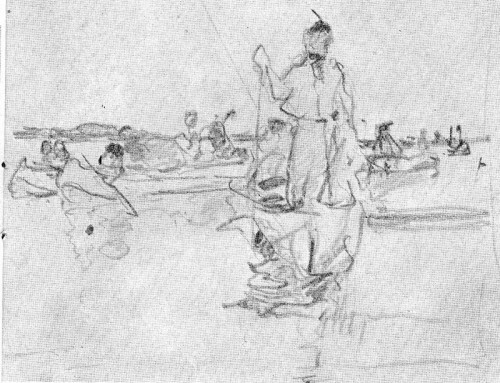 At lower left is the original pencil sketch. 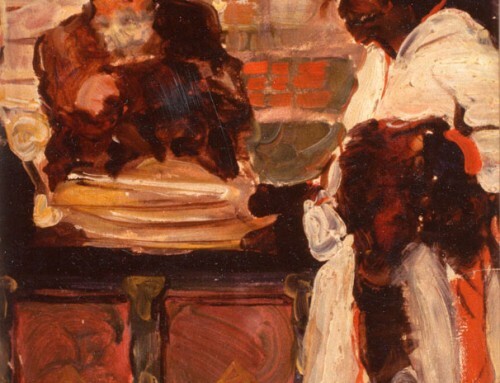 Apgar, John P., Jr. Frank E. Schoonover, Painter-Illustrator, A Bibliography. Morristown, NJ: John F. Apgar, Jr., 1969: cover and 13.
caption: The bronze face of the chief is lifted to proud scrutiny of his friends. 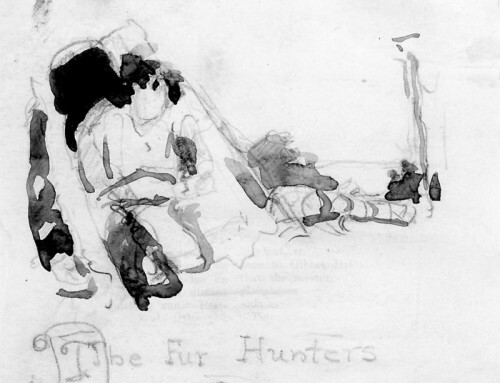 Illustration from the Story the Fur Harvesters by F.E. schoonover, Harper’s Monthly Magazine, October 1912. Schoonover, Frank E. The Edge of the Wilderness, edited by Cortlandt Schoonover. Toronto: Methuen, 1974: 110. Brandywine River Museum. Frank E. Schoonover, Illustrator. Chadds Ford, PA: Brandywine River Museum, 1979: 25, 47. For further commentary, see #473 and #475.